Ultimate Singapore city escapes – on sale now! Visit vibrant Singapore for an exciting city escape – always so much to do and see! Some great package offers here including the 2017 Formula 1 Singapore Airlines Singapore Grand Prix and the Voyager of the Seas fly, stay and cruise from Perth! 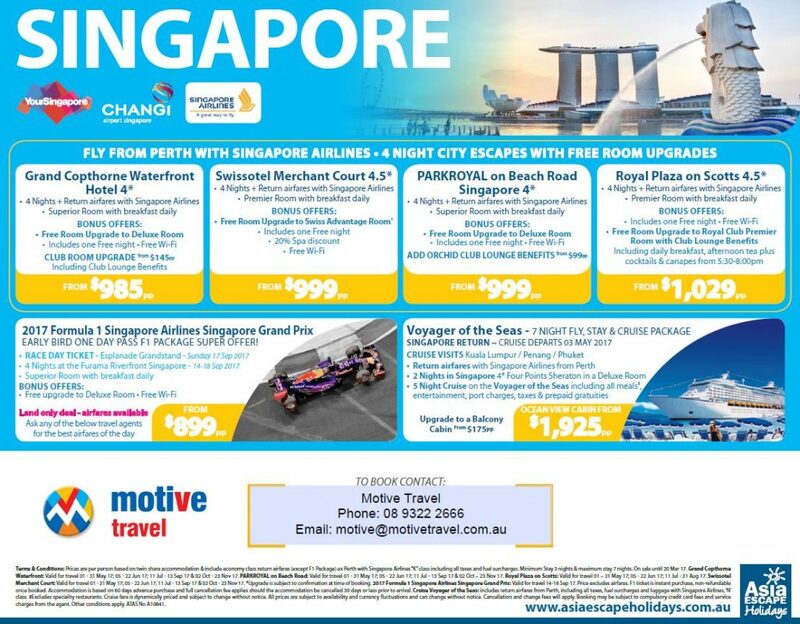 Check out the Royal Plaza on Scotts package including economy class airfares from Perth with Singapore Airlines, 4 nights accommodation with a free room upgrade to Royal Club Premier Room with Club Lounge benefits from $1,029* per person twin share!! *Terms, conditions and travel dates apply. Sale ends 20 Mar’17!